Everyone wants flawless, healthy, glowing skin, and most of us will spend anything on skincare to achieve it. While your makeup cabinet may boast an impressive collection of creams, serums, cleansers, toners, moisturizers, and masks, how do you know if the skincare products you are spending big bucks on contain the right ingredients to beautify your complexion? To optimize your results and avoid overspending, turn to an expert in the field of aesthetic medicine: your plastic surgeon. If you’ve heard it once, you’ve heard it a million times as it’s the golden rule of skincare: protect your skin with sunscreen. Without sunscreen, your skin is susceptible to harmful UVB and UVA rays, leading to damaged skin cells, sun spots, premature wrinkles and even skin cancers. Don’t forget to protect your chest as well as your face. A sun-damaged decolletage can occur as a result of relying on makeup that contains SPF. 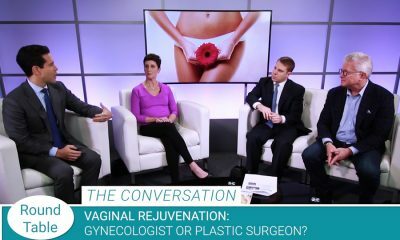 “The changes that happen to your skin when you’re out in the sun for long periods of time can be really traumatic,” warns Dr. Michael Lee, a board certified plastic surgeon practicing in Dallas. When it comes to putting your freshest face forward, exfoliation plays an essential role, adds Dr. Lee. Exfoliating facial cleansers that aid in the gentle removal of the outermost layer of dead skin cells are available over the counter. For severely sun-damaged skin, your plastic surgeon may recommend a deeper exfoliation, such as an an in-office skin resurfacing procedure, a chemical peel or microdermabrasion. The list of ingredients on skincare labels can be confusing to say the least. Here, plastic surgeons break down three ingredients you should be looking for, and explain how they work to improve the quality of your skin. When skin is exposed to UV light, free radicals are created within the exposed cells. Free radicals are unstable atoms that lead to damage on a cellular level. The best way to neutralize free radicals and minimize cellular damage is through the use of antioxidants. Antioxidants are naturally found in the food we eat. Many skincare products also harness the power of antioxidants for topical application, since our skin has the ability to absorb them. Because antioxidants breakdown rapidly, especially when exposed to light, antioxidant-rich creams and serums are often specially packaged in metal pump containers to minimize exposure to light. There are many skincare ingredients with the potential to benefit your skin, but there are only a few that your skin truly needs. One of the most important nutrients required for healthy skin is Vitamin A. Vitamin A derivatives as a whole are known as retinoids. Retinoids speed up cell turnover, clean out pores and boost collagen production, which in turn reduces fine lines. A popular brand of prescription strength retinoid is Retin-A. Another popular brand of retinoid, Differen, was recently approved for over-the-counter sales and can now be purchased at your local drugstore without a prescription. Many other drugstore anti-aging creams contain a less potent retinoid ingredient known as retinol. Skincare is incredibly important and should be actively be pursued by both women and men throughout life. Wrinkles, lines, volume loss, and sun damage all can be addressed when they crop up, but a solid foundation of skincare basics will always make the situations better. Medical Tourism – Safe or Not?